Probably the oldest cookie in the world is a pizzella (singular). The literal translation means “round, small and flat” as in “pizze” (which is also the origin of “pizza”). These flat waffle-type cookies are made from a batter, similar in consistency to cake batter, using eggs, butter, sugar, flour and flavoring, usually anise or vanilla. The batter is poured in small amounts and pressed between two hot iron plates and then removed to cool to a crisp flat cookie. The beauty of pizzelle is in the design of the iron plates. My research tells me that pizzelle were first made in the Italian region of Abruzzo as early as the 8th Century. Families would have pizzelle irons specially made with family crests, special dates, or other celebratory designs. Modern pizzelle irons usually show a floral or snowflake design on one side and a basket-weave design on the other. The delicious taste comes from the flavoring added to the batter, which can be varied to anyone’s taste, including anise (the most common flavor), vanilla, chocolate, lemon, pumpkin and butter pecan. I have seen pizzelle with sprinkles and/or nuts. The most traditional shape, of course, is the flat round cookie. The pizzelle can also be molded into various shapes, such as a cone, cup or cannoli form, and stuffed with your favorite crème filling or ice cream. Another way to enjoy pizzelle is by spreading Nutella or ice cream between two pizzelle. For pizzelle lovers like myself, the options are endless. Try taking a pizzella and dipping it ever so lightly in a glass of red wine, absolutely delicious after a wonderful Italian meal. Pizzelle are found at almost all Italian celebrations, baptisms and weddings to Christmas and Easter. You can find several brands of ready-made pizzelle at Italian specialty stores and local super markets. Here is a basic recipe for you to try. Beat eggs, adding sugar gradually. sticky enough to be dropped by spoon (a little bit thicker than cake batter). The amount of time it takes to cook one cookie varies from one maker to the other. Usually 30-45 seconds is sufficient. Test your batter and pizzelle maker to see what is best. The finished product should be a light golden color. If you are going to mold the dough once it is cooked, this has to be done immediately upon removing the cookie from the iron. These cookies will cool quite quickly. NOTE: The Italian Wedding is one of those classic Italian soups, in which you have both chicken and beef. So easy to make, and even great for freezng in later use. Using an 8-quart pot, add 3 quarts water, and the chicken stock. Rinse chicken under cool water, and remove liver, gizzard, and neck; use for later, or discard. Place chicken in pot with liquid. Add the celery, carrots, onion, parsley and salt and pepper. Bring to boil and skim foam as it rises to the top. Cover with lid and cook for 1 hour or longer, until the chicken is tender. 2. Remove chicken to platter and let cool completely. Keep vegetables in soup, or discard Bring broth to soft boil and make meatballs by combining ground chuck, bread crumbs, cheese, garlic, parsley, eggs, and salt and pepper. Mix together well and make tiny meatballs, about the size of large grapes. Drop the meatballs into the hot broth; skim any foam from meatballs as it rises to top and remove. Skin and debone the cooled chicken; cut into small pieces and return to broth. Let the meatballs and chicken cook together about 10 minutes. 3. Rinse the escarole and remove bottom core; chop and add to the broth. Keep broth on soft boil and simmer for 5 minutes. Pre-boil the acini di pepe in boiling salted water for about 5 minutes, drain and add to the broth; simmer an additional 10 to 12 minutes. Taste soup and add any additional seasonings as desired. This soup will have a rich chicken and beef flavor. Ladle soup into soup bowls and garnish with freshly grated Parmesan cheese. Serves 8 to 10. NOTE: This cake is not only beautiful but just as delicious as an Italian cream-filled cannoli. Topped with a whipped mascarpone frosting, the cake is just rich enough without competing for flavor. 1. Butter and flour four 9-inch round cake pans. Prepare cake mixes as directed and pour batters into prepared pans. Bake as directed, careful not to overcook cakes. Remove from oven and place on cake racks for 10 minutes. Remove cakes and continue to cool on racks for about 1 hour. Prepare filling while cakes are cooling. 2. Make the ricotta cream filling by placing the whipping cream, sugar and vanilla in electric mixer. Beat mixture until thick and smooth, about 5 to 6 minutes. Fold in the ricotta cheese and continue to mix with a fork until completely smooth. Set filling in refrigerator for 15 minutes to set. 3. Make whipped mascarpone frosting by placing cream in electric mixer. Add the powdered sugar and vanilla. Beat on medium until stiff peaks form, about 6 to 8 minutes; add the mascarpone cheese and continue to mix on medium speed until smooth and thick. Place frosting in glass bowl and refrigerate until ready to frost cakes. 4. Place pecans in small fry pan with 2 teaspoons sugar over medium heat. Stir constantly until the sugar disappears and the pecans are candied, careful not to burn. Place pecans in small bowl to cool before garnishing cake. Toast sliced almonds in same fry pan with 2 teaspoons sugar; stirring constantly until lightly toasted. Remove and place in small bowl to cool. When both pecans and almonds are cooled, combine nuts. 5. To Assemble Cake: On large round platter, place one layer yellow cake. Place about 1 cup of the ricotta filling over cake. With large serrated knife, cut the chocolate layer in half. Place one of the halves over the filling. Add another 1 cup ricotta over the chocolate layer. Top the ricotta with the other half chocolate layer, and spread another 1 cup filling. Top the second chocolate layer with the other yellow cake layer. Frost the sides and top of cake with the whipped mascarpone frosting, leaving a 3-inch circle on the top middle of the cake unfrosted for the raspberry preserves. With nuts in hand, press the nuts all around the sides of cake. Spread the raspberry preserves in the middle top of the cake, out about 2-inches. Apply dollops of frosting all around the outer edge of the top of the cake up to the raspberry preserves. 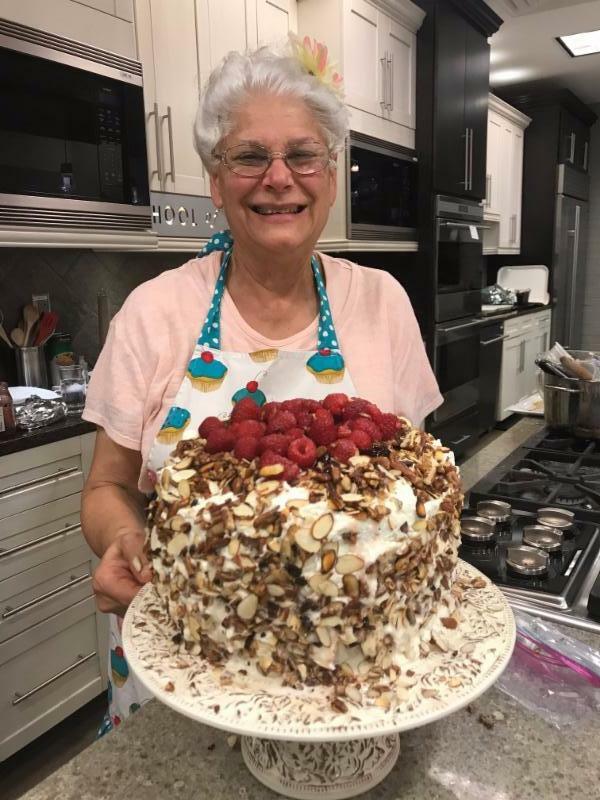 Garnish with fresh raspberries and place a dollop of the frosting in the middle of the cake with raspberry in the center. Serves 16. Get any 2 cookbooks for $20.00 each, plus S/H equals $45.00 total. They will be sent, author signed. 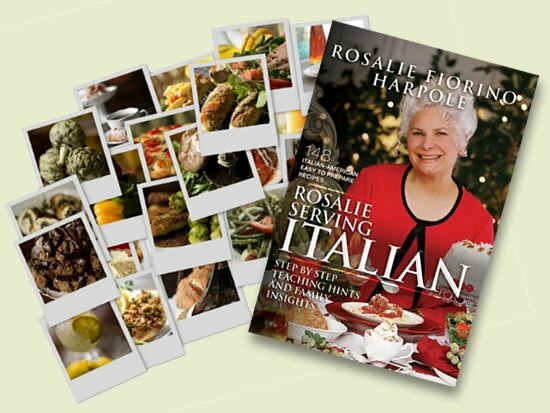 Rosalie Serving Best Loved Italian and/or Rosalie Serving Country. Rosalie will mail these books to you. 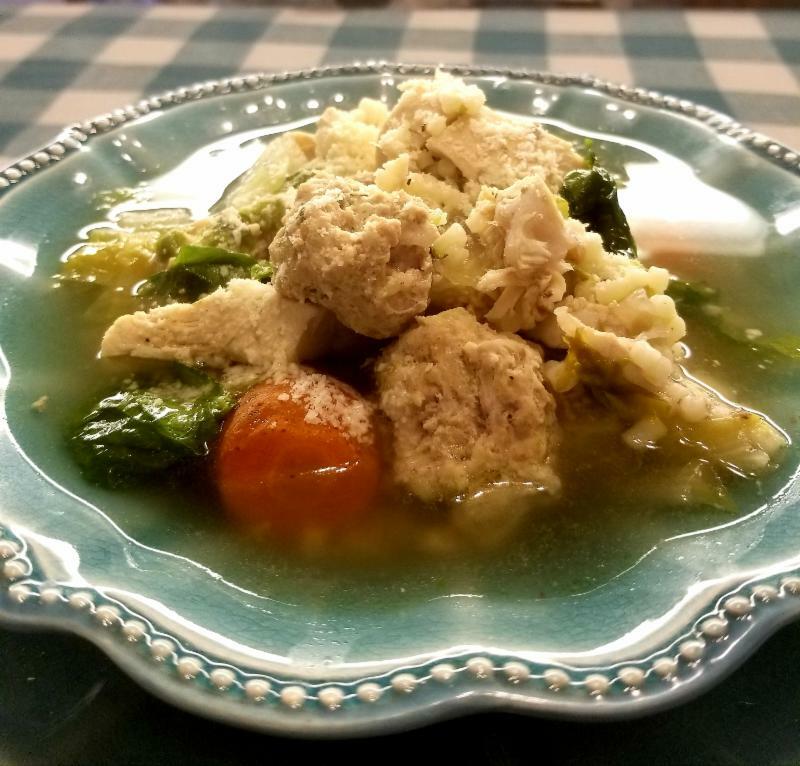 Italian Wedding Soup with Tiny Meatballs and Chicken. White Yogurt Pudding Cake. .
Did you know that bats are not actually blind? It seems that they have been hitting baseballs for a very long time.